Illustration of three distinct pathways proposed to explain calcium carbonate nucleation: ion-by-ion assembly (top), aggregation of large polymeric clusters (middle), or random de-mixing known as spinodal decomposition (bottom). The results of this study show the top “classical” pathway dominates. Image courtesy of Nathan Johnson, Pacific Northwest National Laboratory Enlarge Image. The details matter when synthesizing materials, whether for a chocolate bar or a solar panel. These materials and others are formed through the phenomenon of nucleation. The mechanisms and pathways that underpin this ubiquitous phenomenon are, in general, unknown. Using a combination of experiments, simulation, and theory, an international team captured a glimpse of the initial stages of the nucleation of calcium carbonate. That is, they uncovered subtle details about the process by which the molecules interact to form clusters that eventually grow into large crystals. Their findings revealed that this well-studied system nucleates through a mechanism first proposed more than 100 years ago: by adding on ions one by one. For the case of pure calcium carbonate, getting a definitive answer to the question of how nucleation proceeds required experimentalists, materials scientists, and physical chemists with diverse viewpoints. These experts came from DOE's Pacific Northwest National Laboratory (PNNL), the University of Minnesota, and the Paul Scherrer Institute in Switzerland. Why It Matters: This research pushed the state of the art in both experimental techniques and theory to predict larger behaviors by starting from individual atoms. The work provides new insights into how materials form. "The work addresses fundamental questions about solution speciation and nucleation pathways that are important to numerous fields of science," said Dr. James De Yoreo, a materials expert at PNNL who co-led the research. 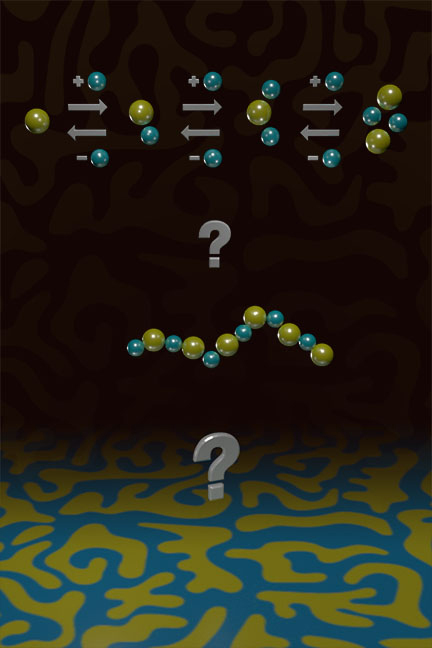 Moreover, this achievement required development of theory and simulations that could directly compute experimental data on bulk solutions from a molecular framework that can easily be extended to other systems. Summary: In spite of its importance in making both human-made and natural materials, understanding the nucleation of crystals has remained a challenge. Why? The mechanisms and pathways are sensitive to subtle changes in molecular interactions and system complexity. As a result, widely differing models of nucleation have been proposed even for simple systems such as calcium carbonate. Looking at the question from one viewpoint wasn't enough. "You had to get all of these experts together to get definitive answers," said PNNL's Dr. Gregory Schenter, who constructed and analyzed the theoretical solution model along with his national lab and university colleagues. Nucleation can occur by one of two mechanisms. In the classical mechanism, molecules attach one by one. In contrast, nucleation can occur via a multi-stage pathway involving groups of molecules bonding together. Which mechanism dominates has implications for materials technologies as well as our understanding of the natural world. To determine which mechanism dominates, the team brought together scientific instruments at facilities in the United States and Switzerland. These instruments included synchrotrons at the Swiss Light Source and powerful computers at three locations. Computers at the National Energy Research Scientific Computing Center and the Environmental Molecular Sciences Laboratory, both DOE Office of Science user facilities, were used along with resources at the Minnesota Supercomputing Institute. The group found that the clusters of atoms leading to nucleation start as simple ionic species, in agreement with the classical picture first formulated more than 100 years ago. However, small differences in the forces involved can have significant impacts on how the calcium carbonate grows. This research pushed the state of the art in both experimental techniques and theoretical calculations, offering new insights into a fundamental and widely used process. Sponsors: Research was sponsored by the Department of Energy (DOE), Office of Science, Office of Basic Energy Sciences (BES), Division of Material Sciences and Engineering and the Division of Chemical Sciences, Geosciences, and Biosciences; National Science Foundation; European Community's Seventh Framework Programme; Swiss National Science Foundation; Materials Synthesis and Simulation Across Scales (MS3) Initiative through the Laboratory Directed Research and Development effort at PNNL; Alternate Sponsored Fellow Program at PNNL; and a University of Minnesota Doctoral Dissertation Fellowship. Facilities: All measurements were performed at the PHOENIX beamline at the Swiss Light Source, Paul Scherrer Institut, Villigen, Switzerland; calculations used resources of the National Energy Research Scientific Computing Center, a DOE Office of Science user facility supported by the DOE, Office of Science; the Environmental Molecular Sciences Laboratory, a DOE Office of Science user facility; and PNNL's Institutional Computing resources. Simulations used resources at the Minnesota Supercomputing Institute. Scientists are interested in calcium carbonate for three reasons. They want to understand major geochemical processes that represent the largest terrestrial reservoirs of carbon dioxide on the planet. They want to understand how biological systems control crystallization processes. Understanding these processes could reveal principles that can be adapted for the synthesis of complex materials in solar panels and other devices. Finally, calcium carbonate offers an opportunity to understand the mechanisms and dynamic events that underlie nucleation, a process that is ubiquitous in technology and nature.